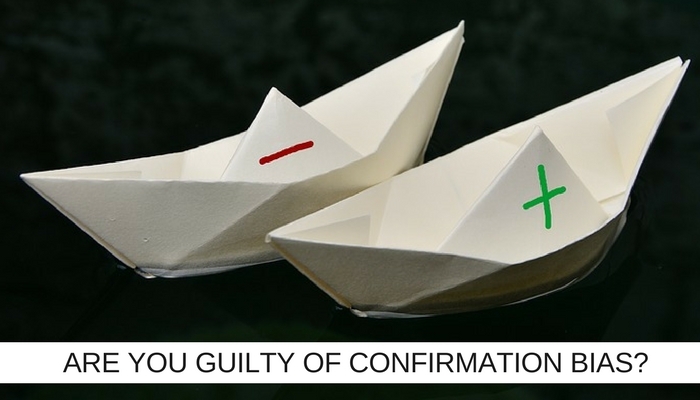 Are you guilty of confirmation bias? It’s a psychological habit where you filter your reality until it resembles something more aligned with your existing beliefs. I think we’re all a bit guilty of it from time to time. For example, you think that your co-workers are lazy so all you see is them sloping off for a cigarette, or you believe that someone you work with is not up to the job so all you see are their faults and mistakes, or you think you can’t lose weight so you say things like you have a sweet tooth or “diets just don’t work for me”. In cases like those above it’s fairly harmless, but what about key decisions that affect IT Project outcomes. In these instances, a long-held belief that has become obsolete or turned out to be just wrong could have a really damaging effect. So why do we do it? I see it as a coping mechanism for all the noise. Think how much information your brain is taking in, from the news on the radio driving into work, the emails and phone calls, the industry journal you read during lunch, the meetings, social media … blah, blah, blah. Remembering it all and knowing how to process it when the time comes for you to recall all this information isn’t easy so you develop shortcuts – like confirmation bias. No wonder we need shortcuts. I canvassed a handful of IT Project professionals. Just under half denied the existence of confirmation bias. If you too are dismissive, consider this. Back in the 1960s, Peter Cathcart Wason developed this ingenious method for teaching and testing for confirmation bias. Take a look at the following sequence of numbers … 2,4,6. What is the secret rule? Ask your colleagues for their thoughts. By the way, 16,18,20 also fit the rule as do 34,36,38. Got it? Can you suggest others that fit? If you’re thinking 22,24,26 … 14,16,18 … 80, 82, 84 … I’d confirm that these also fit the rule. That confirmation might lead you to conclude that you’d sussed the rule. Until I tell you that 1,2,3 also fit, as do 7, 999, 1002. The rule is any three numbers in ascending order. It’s your confirmation bias that diverts your thinking and leads you to work your way through the two times table. Only when you suggest a sequence that wouldn’t fit the rule you envisaged do you get confirmation that you’re on the wrong track, but having made your mind up you’re never going to suggest 91,92,99 … are you? Indeed, of those I messaged who acknowledged the existence of confirmation bias, some were quick to confess to being repeat victims of it, a few even told me that they had identified it as a problem and taken steps to prevent it. Having the values and strategic goals of your business front of mind and aligning your IT Project team with them creates a natural check against confirmation bias. Let’s face it, institutional confirmation bias is pretty rare, it tends to be driven by a single, influential individual. When you approach a project decision with organisational goals influencing your thinking you are less likely to revert to a default bias. Another of my PM friends calls this the “We think” test. Before he offers a solution, he visualises speaking on behalf of his whole team, all stakeholders, department heads, co-workers and the business mission statement. Rather than imagining himself declaring, “I think this is the best way forward” he envisages saying, on behalf of everyone, “We think this is the best way forward.” Instantly, any potential objections from others spring to mind and allow you to consider whether your decision may be unknowingly biased towards your own pre-existing beliefs. In the thick of an IT Project, especially when things are a little “off course”, you have to think fast on your feet. It is easy to go with what you know in these circumstances. The thing is, what worked well in the past (according to your opinion, i.e., what you know) might not be the best course of action now. Challenging yourself out of this comfort zone becomes a habit the more you do it BUT I accept it’s hard because what you know is easier than what you don’t. Resisting taking the path of emotional least resistance is hard, but rewarding. One of the most powerful weapons in the battle against confirmation bias is a good old-fashioned independent pair of fresh eyes. If you have a great IT Services or Project Management as a Service partner – use them! Working in your project, you can become blind to issues and biases that an outsider can spot straight away and the Project Management as a Service market is ever expanding with best-fit solutions for every project challenge. Confirmation bias in IT Project delivery often means that teams make a decision based on experience and then look for reasons to justify it. This then weights future decisions. When I write an IT Project Management blog, the spark of inspiration for the topic could come from a conversation with a colleague or something that happens working with a client on a Project. Regularly, this comment or observation will become the working title. I realised, writing my last piece for CIO.com, that when I research further information to flesh out the article, I subconsciously check that I don’t just find opinions and views that prove the initial hypothesis of the title or my own beliefs. For instance, the working title for this blog was “Could Confirmation Bias Be Impacting Your IT Project Success?”. It came from working with a team who were stuck in something of a rut – making bad choices and then wasting energy finding reasons to justifying them. But one swallow does not a summer make so I made sure that I canvassed lots of opinions to ascertain whether there was a broader problem. I’ve made a commitment to myself to be as diligent with the next big IT Project call I have to make. Some Project Leaders just seem to ooze self-awareness. It seems that the more self-aware you are, the more able you are to see the bigger project picture. Mindfulness, of course, is very much in the media these days with celebrities like Emma Watson, Oprah, Jennifer Aniston, Hugh Jackman all speaking publicly about their meditation practices. Less high profile is Tim, an IT Project Manager from London who told me that he meditates twice a day, concentrating on focussing his mind on a single thought (often a project challenge), acknowledging how and when he gets distracted and then re-focusing. He says that this practice is the key to training his mind to stop and recognise biases before proceeding with a decision. I don’t think you necessarily need to meditate but becoming more self-aware – being able to step back from yourself and take a helicopter view can help you make subconsciously biased decisions. In IT Project Management, in an industry moving this fast, we can’t be in the business of “olds”. You weren’t born with any beliefs. You learn them when you qualify or start working in IT Project Management. If what you learn along the way was wrong or becomes dated then it’s imperative that we unlearn those beliefs and learn new ones. I feel like Yoda! As an industry, we have to prevent confirmation bias impacting successful outcomes.